Adjustable Roof Mount Bracket, for pitched roof installation. Roof Mount Angle Frame, adjustable for roofs with a 3/12 to 12/12 pitch. 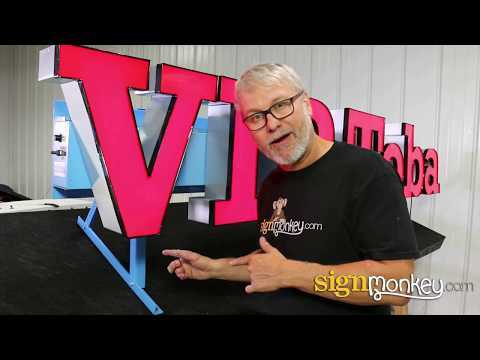 Frame is designed to easily mount to your signs raceway. We recommend one frame per 4 to 6 feet of raceway. Frames will be folded for shipping. Frame is fully adjustable, the only tools necessary are to tighten the locking screws. Care should be taken to seal roof penetrations. Frame is only as strong as its mounting surface. We recommend through bolting through roof with wood or steel backing plate. Installer is required to determine if the roof can support the sign installation. Customer is responsible to seal the roof around the bracket to prevent leaking. The bracket should be at least the total height of the letters. For example: If overall height of your Raceway sign is 22” then use a 24” bracket. Frame can be paint to match the raceway of your sign.